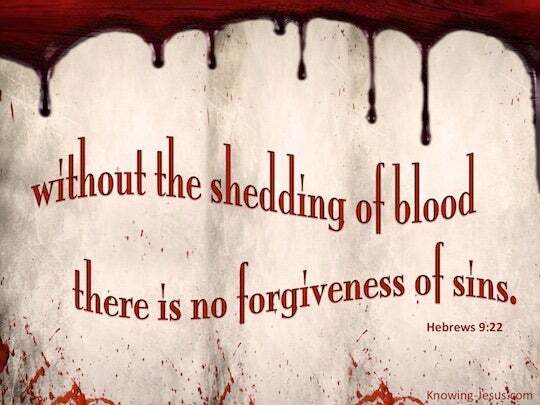 ﻿ Hebrews 9:22 And according to the Law, one may almost say, all things are cleansed with blood, and without shedding of blood there is no forgiveness. And almost all things, according to the law, are cleansed with blood, and remission does not occur without bloodshed. 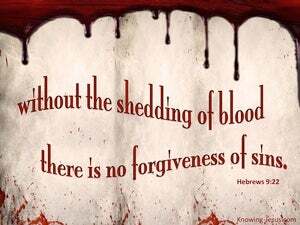 And, according to the law of Moses, almost everything is [ceremonially] cleansed by blood, for there is no forgiveness [of sins] apart from the shedding of blood. And, indeed, according to the law, almost all things are cleansed by blood; and without the shedding of blood there is no remission. And by the law almost all things are made clean with blood, and without blood there is no forgiveness. Indeed, under the law almost everything is cleansed with blood, and without the shedding of blood there is no forgiveness of sins. and indeed according to the law almost every thing is purified with blood, without the effusion of which, there is no remission of sins. And according to the law, almost all things are purified by blood; and without the shedding of blood there is no remission. 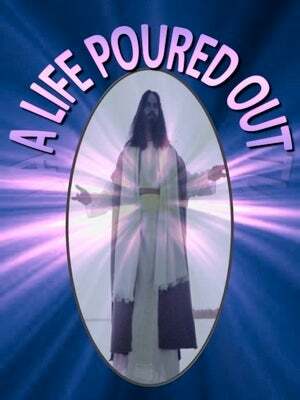 In fact, under the Law, almost everything is purified with blood, and unless blood is poured out nothing is forgiven. And almost all things are according to the law purified with blood, and withoutshedding of blood there is no remission. And almost all things are purified according to the law with blood; and without blood-letting there is no remission. Indeed, nearly everything is purified with blood according to the law, and apart from the shedding of blood there is no forgiveness. And almost all things are, by the law, purged with blood, and without shedding of blood, is no remission. In fact, one might almost say that by Law everything is cleansed with blood. No blood shed, no remission of sins! almost everything is purified by blood, and without the shedding of blood there is no remission of sins. Indeed according to the law almost everything was purified with blood, and without the shedding of blood there is no forgiveness. According to the Law, nearly everything is cleansed with blood, and apart from shedding of blood there is no remission. And almost all things are according to the Law purified with blood, and without shedding of blood there is no remission. And almost all things, according to the law, are purified with blood, and without the pouring out of blood there is no forgiveness. And, nearly, all things, with blood, are purified, according to the law, and, apart from blood-shedding, cometh no remission. And almost all things are purified by blood according to the law, and without effusion of blood there is no remission of sin. Indeed, under the Law, almost everything is purified with blood; and, unless blood is shed, no forgiveness is to be obtained. And almost all things are by the law cleansed with blood; and without shedding of blood is no remission. Indeed we may almost say that in obedience to the Law everything is sprinkled with blood, and that apart from the outpouring of blood there is no remission of sins. In fact, under the law, almost everything is purified with blood, and without the shedding of blood no forgiveness is granted. And nearly all things are cleansed, according to the law, with blood; and apart from shedding of blood there is no remission. 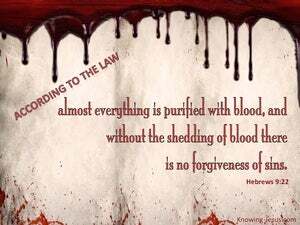 And according to the law almost all things are purified with blood; and without shedding of blood there is no remission. and with blood almost all things are purified according to the law, and apart from blood-shedding forgiveness doth not come. 21 And in the same way he sprinkled both the tabernacle and all the vessels of the ministry with the blood. 22 And according to the Law, one may almost say, all things are cleansed with blood, and without shedding of blood there is no forgiveness. 23 Therefore it was necessary for the copies of the things in the heavens to be cleansed with these, but the heavenly things themselves with better sacrifices than these. 'He shall also do with the bull just as he did with the bull of the sin offering; thus he shall do with it So the priest shall make atonement for them, and they will be forgiven. 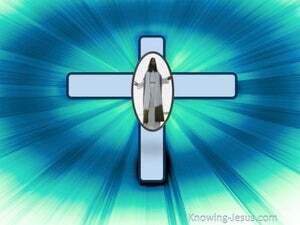 'The second he shall then prepare as a burnt offering according to the ordinance So the priest shall make atonement on his behalf for his sin which he has committed, and it will be forgiven him.